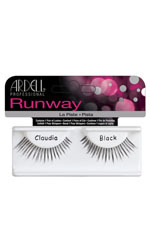 Ardell Individual Knot Free Lashes Medium Brown, made to blend in with your natural lashes. Try these weightless, waterproof, and super easy to apply individuals. Giving you up to six weeks of gorgeous fluffy lashes. Pour a few drops of LashTite adhesive onto a piece of foil. Gently lift a individual lash from the tray with tweezers. Dip the end of the lash into adhesive. Starting at the centre of the eyelid, apply lashes one at a time by placing the lash cluster on top of one of your own natural lashes. The end should be close to, but not touching your eyelid. Support lash gently with fingertips until adhesive sets. Work towards the outer corner. Return to centre and gradually work inward until lashes blend. DuraLashes should be replaced as your natural lashes shed. (About 4 to 5 weeks). Care and Cleaning: Cleanse lashes with cool water. Oil based cleansers soften adhesive. Be gentle. Do not rub or towel dry your eyes. Allow your lashes to air dry. Like natural lashes, DuraLashes will singe. Avoid open flame or direct heat. Removal: Your DuraLashes can be easily removed with specially formulated Lash Free Adhesive Remover. Never try to pull them off after adhesive has set.